If the bill to expand Pennsylvania’s camera program beyond Philadelphia becomes law, it would save lives, said Senate Majority Leader Dominic Pileggi, R-Delaware County, who sponsored the bill. Not everyone agrees. Critics say the cameras actually make intersections more dangerous, mar due process and line the pockets of private companies. There’s no guarantee the Senate bill or a similar version will become law anytime soon. A ban on texting while driving — something many legislators from both parties support — has come up in the last two sessions without advancing. The teen driving reforms that Gov. Tom Corbett signed into law Tuesday were years in the making, and not as strong as originally proposed. Of course, more red-light cameras would bring the state something a texting law couldn’t: money. Philadelphia installed cameras in 2005. Since then, $45.3 million in fines have been collected, according to the Philadelphia Parking Authority. More than half of that money — $24.2 million — has gone to the Arizona company that maintains the cameras, the authority said. The other $21.1 million went to the state Department of Transportation. This summer, Corbett’s Transportation Funding Advisory Commission recommended expanding the camera program to other cities partly as a way to raise $2.5 billion to pay for transportation improvements across the state. But the Senate bill is concerned with safety, not revenue, said Pileggi spokesman Erik Arneson. Any money would have to be used on projects to improve safety. Money could not be used for road maintenance, Arneson said. Violations in Philadelphia have dropped as drivers learn about the cameras, Arneson noted. Drivers running red lights killed about 676 people in 2009 and injured another 113,000 across the country, according to the Insurance Institute for Highway Safety. Cameras reduce red light violations by 40 percent to 50 percent and injuries 25 percent to 30 percent, the institute found in a study. Not all the studies agree. The Philadelphia Inquirer reported this week that crashes in the city are up 12 percent for the 15 intersections that have had cameras for at least a year, according to police data. The Philadelphia Parking Authority told the paper its numbers show crashes have declined. The police department, the paper said, still supports the camera program and believes it is making driving safer. Studies have found crashes increased after cameras were installed in Virginia, Los Angeles, Ontario and Australia, among other places. 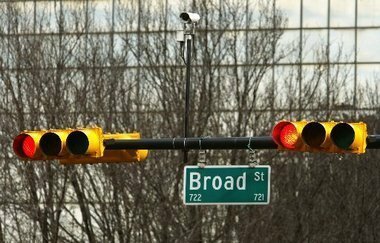 Communities can improve intersection safety for less money by improving sight lines, using a longer yellow light or having a one-second pause where all lights are red, Bowman said. Safety is not the only reason some object. The cameras raise due process concerns, said Edward Spreha, a Harrisburg attorney who specializes in motorist law. If a person wishes to contest a citation, the Senate bill would require the person must present evidence to prove he or she is not guilty. Also, the cameras do not record the driver’s face. That would make it difficult for a person to prove he or she was not driving, Spreha said. Other cities and states have tried red-light cameras and wished they hadn’t, said Alana Miller of the Pennsylvania Public Interest Research Group. The group is releasing its own study on red light cameras this morning. Many times, Miller said, cities sign contracts with camera operating companies that benefit the companies more than the city or its citizens. A number of cities have tried to cancel their contracts only to find they still owed the company millions, she said. “In the long run,” Miller said, “it’s often a bad financial deal for cities. Many contracts give camera companies the right to determine where the cameras are placed. The intersections that will draw the highest fines, not necessarily the most dangerous, can wind up in the lens, Miller said. Under the Senate bill, the system administrator would have to tell PennDOT where it will place the cameras. PennDOT would then issue recommendations for alternative intersections. The administrator could disagree with the recommendations and use its initial location, provided it gives PennDOT its reason and supporting data in its annual report. The Senate bill has a long way to go before becoming law. With other hot issues — a school voucher bill, a Marcellus shale extraction fee, liquor store privatization — dominating attention, the camera bill might not move this year or even this session. If the Senate bill, or some form of it, becomes law it would raise a new question. Who’s buying? The bill would not require cities to install cameras. It only gives them the option to do so. Many of the 19 cities that would be eligible under this bill are financially strapped. Some — including Harrisburg, Pittsburgh, Reading and Scranton — are in the Act 47 program for fiscally distressed cities. Others, like York, are struggling to balance a budget for 2012. The cities would have to pay for the cameras, under the bill. Since any money collected cannot be used in a city’s general fund, it remains to be seen if these cities would invest in the cameras. “Each city would have to weigh if the expense is worth it and if they have the funds to pay for it,” said Amy Sturges, the director of Governmental Affairs for the Pennsylvania League of Cities and Municipalities.